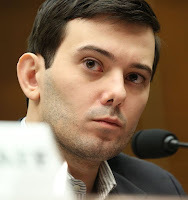 Martin Shkreli is listed as an entrepreneur, hedge fund founder, and pharmaceutical executive. All of these are good things, at least to people who appreciate the formation of new ventures, financing of ventures, and work to improve healthcare. He has also been described as the “most hated man in America.” The trigger for this was when his company Turing Pharmaceuticals acquired the drug Daraprim, an essential drug for treating AIDS-related parasitic disease, and raised the price from USD 1,350 to USD 75,000 for a monthly course of treatment. Denouncements from individual doctors followed, then from associations, and finally the US congress and presidential candidates singled out Turing and Shkreli for critique. High drug prices are not unusual in the US, however. The most recent top 10 list of drug prices I have seen posts two Hepatitis C treatments from Gilead Sciences at the very top, both above Daraprim. There are some differences that might explain this. First, Daraprim actually cost 13 times more in the US than in most other developed nations before the price increase, which increased the price by another 56 times. As a result, in the US patients pay 750 dollar for a pill that costs 1 dollar in Australia. Second, Daraprim is an old drug with no patent, so it could be made and sold generically – but Turing has distribution rights preventing that from happening. Gilead’s drugs are recently developed and under patent still. But we should not make too complicated explanations of things that have simple reasons. In a recent paper in Administrative Science Quarterly, Sinziana Dorobantu, Witold Henisz, and Lite Nartey look at how society responds to controversies about firms, and they find very clear patterns. Moreover, they look at gold mining internationally, so their research is free of any specifics of the US and the pharmaceutical industry. Their explanation is simple and provocative: history and track record matter. First, people form beliefs about firms based on how they have behaved in the past, and will lash out at firms with past misbehavior. Shkreli already had triggered a pricing controversy, so he definitely fit this pattern. Second, the early statements from stakeholders set the tone for the rest, both because others often follow their assessment of an action as bad (or good), and because prominent stakeholders are imitated by others. Shkreli’s initial critics included Infectious Diseases Society of America, which is easily among the most prominent voices for this form of health care. Third, how people form beliefs about firms is largely a function of firm track records. Often a firm will have defenders who try to counter criticism, but friends are earned through actions. Martin Shkreli had no friends rising in defense, and no track record suggesting a reason for having any. A true cynic might note that none of this matters, because getting 750 per pill is still a lot better than getting 13.50, or 1 dollar. But here the research by Dorobantu, Henisz, and Nartey shows that the cynic should be careful, because the stock market pays close attention to critics of the firm, and the firm loses value when it is under fire for misbehavior. In the case of Turing’s price increase, things went even further. Because drug pricing was getting legislative attention, the Nasdaq Biotech Index fell 4.4%, shrinking the value of an entire industry as a result of the actions of one company. Dorobantu, Sinziana, Witold J. Henisz, and Lite Nartey. 2017. "Not All Sparks Light a Fire: Stakeholder and Shareholder Reactions to Critical Events in Contested Markets." Administrative Science Quarterly, forthcoming.